LAWRENCE – Similar to its World War II allies, Japan used art to promote its war machine during the 1930s and '40s. In the following decades, artists during this era were categorized as either collaborating with the wartime government or being anti-war. 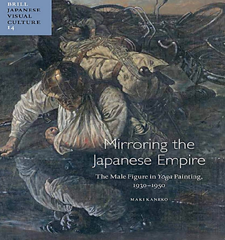 In her book “Mirroring the Japanese Empire: The Male Figure in Yōga Painting 1930-1950,” University of Kansas associate professor of Japanese art Maki Kaneko argues that a more nuanced understanding of these artists is needed. Kaneko looks at yōga painters who became well-known for their works featuring male images during and shortly after the Asia-Pacific War. In Japan, yōga refers to a Western style of painting. Yōga painting didn’t receive the level of censorship that other art forms, such as film and mass media, did during Japan’s era of militarism. Nonetheless, many yōga painters used images of men to characterize Japan as a masculine nation, which was in line with the government’s focus on health. Inspired by Nazi Germany’s health policies, Japan began placing a greater emphasis on the male body as the country became increasingly militarized. Since most of the artists at that time were men, Kaneko sees their paintings of the male body as a mirror image of themselves. “This was a time when men’s health and bodies as well as art were a national issue,” Kaneko said. Not all artists painted the macho, brave solider that was promoted by the Japanese government. Instead, Kaneko said artists used their canvases to craft their idea of male identity in Japanese society. “Some artists wanted to promote a man with artistic spirit and intellectual mindset so they could claim that artists were very much an integral part of Japan,” she said. After World War II, art historians have largely placed yōga painters into two camps: supporters of the war who wrongly collaborated with a militaristic government and artists who heroically opposed the war. That’s too simplistic of a characterization, Kaneko said. Artists who were closely tied to the militaristic government also produced artwork that presented a more ambivalent interpretation of the war. Meanwhile, artists seen as anti-war painted works that can be interpreted as nationalistic and patriotic. Kaneko focuses on three artists who leave a complicated legacy. Fujita Tsuguharu was the most prolific wartime painter and was commissioned by the Japanese government to record war campaigns. One of his most recognized works is a gruesome painting of the U.S. and Japanese battle at Attu Island. When the painting was created in 1943, there was question if the piece served as propaganda because of its graphic nature. Viewed as a government collaborator, Fujita fled to France after World War II and remains a controversial figure in Japan. Another artist Kaneko studies is Matsumoto Shunsuke, who was exempted from conscription because of a hearing defect and who today is widely seen as a hero for his anti-war sentiment. In his iconic self-portrait “Standing Figure,” Matsumoto looms in front of an urban landscape with his hands hanging to the side and his face turned slightly away from the viewer. Some view Matsumoto as being heroic and brave in the painting. Others see him as lacking confidence, anxious and ambiguous about the war. Kaneko has a different take. She also looked at the work of Yasui Sōtarō, who in Japan is seen as a master of modern art. By World War II, Yasui was a well-established artist and known for his portraits of Japan’s cultural elites. While the painting subjects weren’t directly involved in the war efforts, Kaneko argues that by holding top spots in the hierarchy of Japanese society, they contributed to cementing Japan’s nationalistic identity. The different views of the Japanese male – a brave, strong solider versus an intellectual and artistic civilian — weren’t opposing views and co-existed in Japan’s nationalistic sentiment, Kaneko said. “They were package together to solidify Japan as a physically and spiritually strong nation,” Kaneko said.